7/12/2012 – Yesterday we reported on the start of the historic World Championship match between Boris Spassky and his challenger Robert Fischer. In a completely drawn position the American had lost a bishop and was fighting to survive. Many thought he would make it, but after resumption Spassky played with great precision to win the first game. We ask our readers: could the game have been saved? 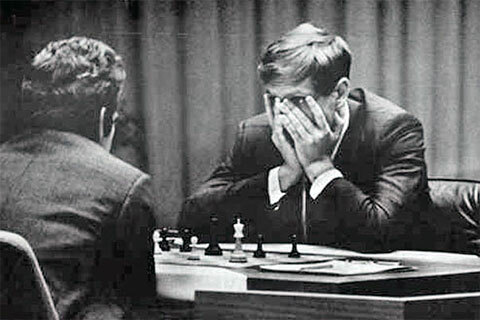 As we reported yesterday the World Championship Challenger, grandmaster Bobby Fischer from USA, made an extraordinary move in the first game against Boris Spassky: instead of going for a safe draw – which would have been his first with the black pieces against the Russian – Fischer captured a "poisoned" pawn, a move that left cost him a bishop for two pawns and put him in grave danger of losing the game. US chess columnist Robert Byrne said: "Fischer is playing desperately for a draw." GM Larry Evans felt Fischer had drawing chances, "perhaps." Yugoslav chess GM Svetozar Gligoric thought Fischer's chances were "slim." But Russian delegation chief Nikolai Krogius said it was "...probably a draw," which left Fischer fans with reasons to hope. We hand over once again to Frank Brady, who watched the second day of the game unfold. Fischer analyzed the position through the night and appeared for the adjournment, looking tired and worried, just two minutes before Schmid opened the sealed-move envelope. 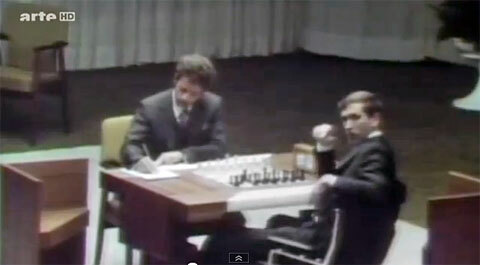 Schmid made Spassky's move for him on the board, showed Fischer the score sheet so he could check that the correct move had been made, and activated his clock. Fischer responded within seconds, and a few moves were exchanged. Fischer then pointed to the camera aperture that he had complained about the day before, and quickly left the stage with his clock running. Backstage, he vehemently complained about the camera, and said he wanted it dismantled before he continued play. ICF officials quickly conferred with Chester Fox, owner of the film and television rights, who agreed to remove the camera. All of this took time, and Fischer's clock continued running while the dismantling went on. Schmid finally went back to Fischer's dressing room and knocked at his door. "Bobby, the cameras have been removed," he called. "You're a liar," Fischer snapped. Schmid, furious, went back to the stage. Eventually, Saemunder Paalsson, the policeman who had been acting as Fischer's unofficial bodyguard, assured Bobby that he had personally checked that the camera was no longer in operation. When Fischer returned to the stage, thirty-five minutes had elapsed on his clock. 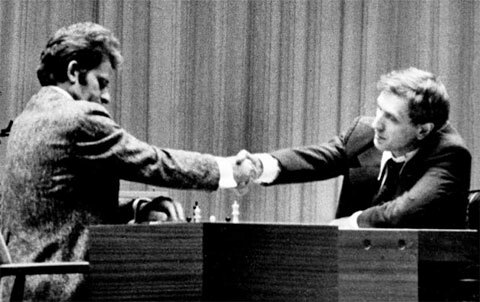 Fischer began fighting for a draw, but Spassky's moves were a study in precision and his position became stronger as they played on. Eventually, it became clear that Spassky could queen a Pawn. 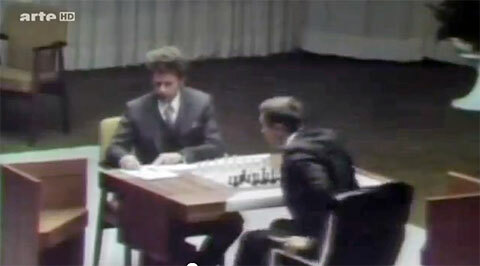 Instead of making his fifty-sixth move, Fischer stopped the clock and offered his band in resignation. He wasn't smiling. 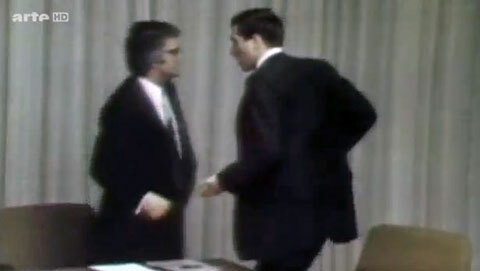 Spassky did not look him in the eye as they shook, but continued to study the position. Fischer signed his score sheet, made a helpless gesture as if to say "What am I supposed to do now?" and left the stage. It is not difficult to guess his emotional state. <img data-cke-saved-src="http://en.chessbase.com/portals/4/files/news/2012/brady03b.jpg" src="http://en.chessbase.com/portals/4/files/news/2012/brady03b.jpg" width="150" "="" height="218" border="1" class="dropshadow" style="float: right; margin-left: 10px; margin-bottom: 5px; width=" 250="">Though there have been a number of world's championship matches where the loser of the first game went on to win the match, including Spassky-Petrosian, 1969 (and Euwe-Alekhine, 1935, Petrosian-Botvinnik, 1963 and Stenitz-Tchigorin, 1892), there is no question that Fischer considered the loss of the first game almost tantamount to losing the match itself. Not only had he lost, but he had been unable to prove to himself and to the public that he could win a single game from Spassky. 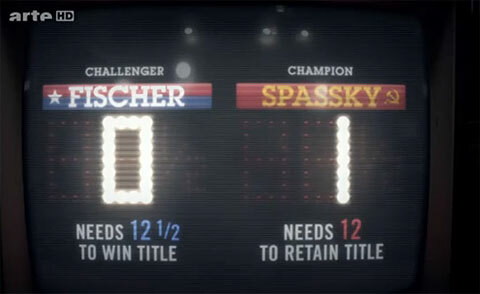 Their lifetime score stood at four wins for Spassky, two draws, and no wins for Fischer. Bobby undoubtedly descended into a rage of self-doubt and uncertainty. Since an inner-directed revenge was unthinkable, the cameras were to blame for his loss, not Spassky's superior – or his own inferior – play. The above text was taken from the Batsford edition of Frank Brady's 1974 book, of which we possess (and treasure) a rare copy. There appears to be one available at AbeBooks, but probably our readers will find more. Was 29...Bxh2 an amateur-level blunder? Many modern chess engines show interest in playing 29...Bxh2, at least in the first seconds of their computations. And they do it not because they are going to try to save the bishop – simply sacrifice it for two pawns and hold the draw. It would be interesting if we could, today, 40 years after the historic move was made, get some final analysis by the most powerful computers in the world. How about a communal Let's Check analysis session, where everyone looks at lines that have not yet been analysed to a great depth. 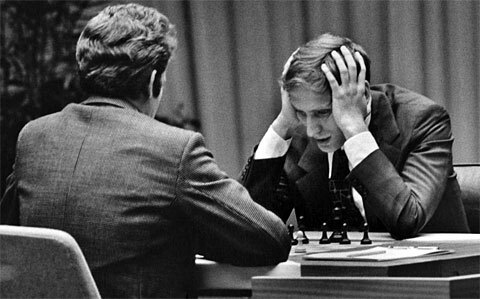 Our suspicion: it will turn out that Fischer's move was playable, and that he could have and would have held the draw – if his situation in Reykjavik had not been so full of anguish and frustration. 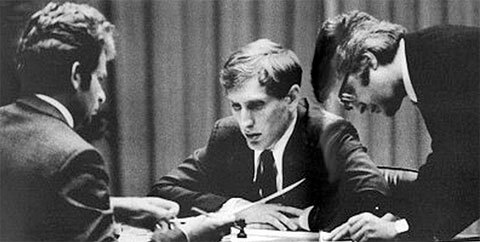 11.07.2012 – That could have been the headline of our newspage, exactly forty years ago this afternoon, when after some harrowing manoeuvring the US Challenger Bobby Fischer sat down to the first game of the World Championship match against Boris Spassky in Iceland. It was a very tense encounter and has been beautifully recreated by Frank Brady, who was an eye-witness at the scene. 25.04.2011 – ... from America’s Brightest Prodigy to the Edge of Madness. That's the full title of a fascinating book we are currently reading, one which was written by Dr Frank Brady, who knew Fischer from his early youth onwards. It is going to take us some time to go through all 402 pages, so for now we bring you, courtesy of the English magazine CHESS, an in-depth review by Sean Marsh.